The Scrum Master is Simon Kneafsey. 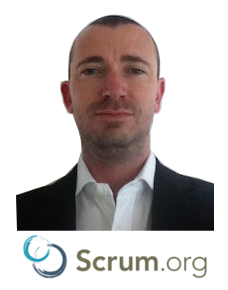 Simon is a Professional Scrum Trainer with Scrum.org, the home of Scrum run by Scrum co-creator, Ken Schwaber. Simon offers Professional Scrum Certification training courses globally and works with clients to introduce Scrum to their organisations. He is one of only a few Scrum trainers globally able to offer the full range of Scrum.org courses. Simon led the development of digital properties for Associated Newspapers including www.dailymail.co.uk (largest newspaper website in the world) and www.metro.co.uk. Simon also led the development of the Times iPad app (number 1 grossing app in the UK iTunes store at launch). Simon is also an Accredited Kanban Trainer (AKT) with the Lean Kanban University. With 20 years software development experience with 100’s of global clients and 10 years experience training and coaching Scrum Masters, Product Owners, teams and organisations in their transition to Scrum and Agile. Simon’s knowledge and experience speaks for itself. Simon has worked with some of the brightest and most successful companies including Google, Marks & Spencer, the European Space Agency and Pearson. Read more about the Scrum Masters clients. Simon runs regular public Scrum training courses. He is also happy to provide private training and coaching for organisations. Please contact him if you wish to learn more. You can learn more about Simon Kneafsey on LinkedIn.